A Shepherd's Heart: What Does Society Really Want When They Cry Out For Tolerance? 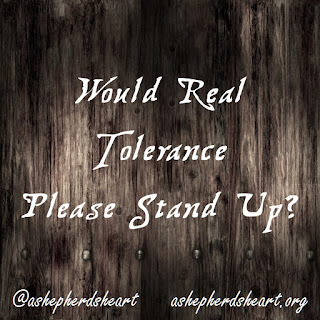 What Does Society Really Want When They Cry Out For Tolerance? There used to be a time when tolerance essentially meant that we'd all appreciate each others differences and treat one another with respect despite our differences. It seems that those days are long gone. Some might argue that this isn't the case or that this is a simplified definitions but you can look no further than social media, TV to see that there isn't much in the way of appreciation rather, you see the opposite of it. So, what does society really want when they cry out for tolerance? I've become convinces that what society really wants is: Sameness. Same thoughts, sames views and same everything. They want everyone to agree on everything and then if you don't you're called a bigot, hateful, or numerous other things because you have a different view. It's insane really and it's counter intuitive to what tolerance is supposed to be but - that's what they want and they show their true motives by how they so vehemently disagree and sling hate. The reality is that when it come to any topic and no matter what side you land on the topics, whether politics, the economy, healthcare, faith, movies, music...anything...you see a myriad of responses. The good, the bad and the downright hateful and ugly. Instead of rational discussions or debate we find hate being shot back and forth over a difference of opinion. It's sad really because while it's fine to have a difference of opinion it's not fine to try to destroy others with the words because the old saying, "sticks and stones may break my bones, but words will never hurt me" is a big fat lie! Words actually do stick with you much longer in comparison with the healing of a physical bruise. The bruise left in one's heart, soul and mind lingers far after the words meant for destruction have been spoken. Our words are either life giving or bring death upon the hearer. We need to choose more wisely. Also, think about it from another practical perspective regarding "sameness"...how boring would it be if we were all "cookie cutter people" where we all believed and had the very same views about everything?! Now don't get me wrong, there is something good about being like-minded, especially in faith as God calls us to unity, however, even like-minded people sometimes don't always see eye to eye and that should be OK. In the business world it makes for good teams when the varying viewpoints come together to create a plan or solve a problem working together. Not sure why it can't be that way in life in general and back to the original understanding about the intent of tolerance. Differences should be OK and no matter what society says, we don't always have to agree. We've got to find a better way in society to live together even with our differences. Now this doesn't mean that we can't share an opinion but it does mean that we ought to work hard to do our part to guide the discussion in respectful and loving way balancing all things with grace and truth. It may not be completely in our hands but we can at least do our part to be a part of the solution instead of being part of the problem. Sameness and Tolerance aren't the same thing and never will be so lets pray we as human beings as well as people of faith, find a better way - a more respectful, loving and kind way to communicate with God's help seasoned with grace, truth and love.